Potbellied pigs can make intelligent, loving and enjoyable pets. However, as with any animal, you need to understand your pig's natural behaviors and his needs before you even think about bringing him into your home as a member of your family. Potbellied pigs can become dangerous if they're not handled properly from a very young age. Potbellied pigs most often become aggressive due to mishandling by their human owners. Pig owners may be inclined to treat their pigs like family members rather than farm animals. 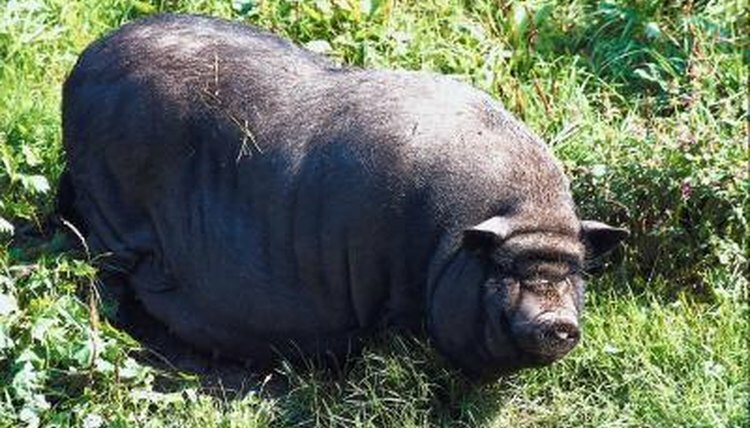 Potbellied pigs, weighing in at an average of 100 to 250 pounds as adults, are smaller than their farm-bred and wild cousins, but mentally there are few differences. Pigs who are raised in a human household will treat humans as herd members. Pigs who treat humans as herd members will naturally become territorial toward those who invade his territory. He may also challenge family members for dominance as he matures into an adult. It tends to be easier to prevent aggression than it is to try to change a mature pig's behavior. Pigs are more likely to become aggressive if they're raised inside the home, do not have access to other pigs and have limited access to the outdoors. Treating your pig like pig, rather than a spoiled chihuahua or a human child, will help prevent aggressive behaviors. Before you purchase your pig, take the time to learn about potbellied pigs and spend time interacting with pigs at a responsible breeding facility or animal rescue that deals with pigs. Education before purchase will help you learn how to, and how not to, treat your piggy once you bring him home. Proper handling and adequate housing facilities are absolutely essential for preventing aggressive behaviors from developing. Your first step in bringing your pig's behavior under control is to move him outside of your home and into a pen or run. If you have the ability, bring in a second pig to help socialize your pig and provide appropriate companionship. Once you have your pig situated outdoors, you need to begin teaching him to respect you. Handle him firmly and calmly. Establish yourself as a dominant herd member and do not back down when your pig challenges you. Some behaviorists feel that the best way to bring an aggressive pig under control is to adapt pig behavior yourself and to communicate with your pig using pig-style body language and vocalizations. An aggressive pig is a dangerous pig. Pigs can charge, bite and run over humans as well as other household pets. Pigs with tusks may gore the object of their aggression. You should immediately take measures to protect the more vulnerable members of your household from your aggressive pig. Children and pets are especially at risk of being harmed by a dangerous pig because they're naturally low in household dominance, and your pig may view attacking them as an easy way to elevate his own position in the herd. If you cannot bring your pig's behavior under control, you may have to rehome him to protect the vunerable members of your household from injury. What Is the Smallest Kind of Pig You Can Get as a Pet? Do Pigs Catch Colds or Flus? On Average How Long Do Pigs Live? How Do Pot-Bellied Pigs Tell You They Need to Go to the Bathroom?